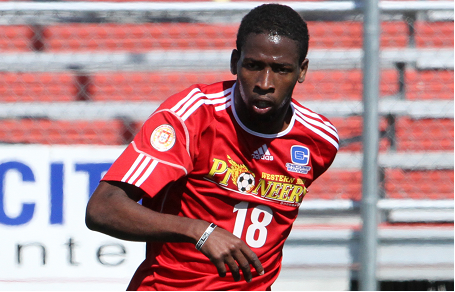 Javoni Simms scored an 88th minute equalizer to help the Western Mass Pioneers salvage a 1-1 draw against CFC Azul at Central Connecticut State University on Saturday. Simms’ late-game heroics canceled out a 29th minute strike from Azul striker Mario DiMiceli. Andrew Esposito collected four saves for the Azul, while Borja Angoita made a pair of saves on the evening. The draw put the Pioneers at 0-0-1 (1 point), while the Azul remains unbeaten through their first two (1-0-1, 4 points). CFC found the scoreboard just before the half hour mark when Luke Perry found DiMiceli for the opening salvo, sending the partisan Azul crowd to its feet. The Azul held out hope for their second shutout victory until the 88th minute, when Ronaldo Vieira sent a pass to Simms, who beat Esposito for the score. Western Mass returns to action at 7:30pm on Friday, when they open their home slate against GPS Portland Phoenix on the refurbished pitch at Lusitano Stadium. CFC will be back on the field at 7pm on May 31, when the Ottawa Fury welcome them to Algonquin College Soccer Complex.